By clicking "Order Now", You hereby accept Our Terms and Conditions, some of which are repeated below the Order Summary on the right hand side of this page. Your order is backed by a 30 day money back guarantee. TERMS REMINDER: DUE TO HIGH DEMAND, CUSTOMERS ARE LIMITED TO ONE KIT PER PERSON. WHEN YOU ORDER TODAY, WE WILL SHIP YOU A 30 DAY SUPPLY FOR ONLY $59.95 AND YOU’LL RECEIVE FREE SHIPPING. FREE SHIPPING IS AVAILABLE ANYWHERE IN THE U.S. OR CANADA. By placing your order today to a U.S. or Canada address, you’ll never pay shipping as long as you remain in the automatic replenishment program! Starting at approximately 30 days from your order date, we’ll send you a new 90-day supply every 90-days with free shipping and handling for the guaranteed low price of $59.95 billed monthly. There’s no obligation or commitments – you can cancel at any time. If you would like to customize this program or cancel future shipments, simply call 1-888-983-2703. By clicking the “Order Now” button on this page, you certify that you are a competent adult who is 18 years or older and agree to the terms above and to our site’s terms and conditions, and authorizing us to charge the payments to the credit card or debit card you have provided. 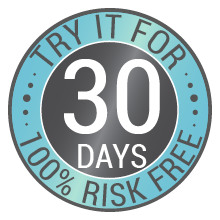 Your order comes with our 30-day risk-free guarantee. Payments will appear on your credit card or debit card as “Advanced Dermatology”. We offer free shipping within the 50 United States of America and the District of Columbia. Also available for shipping to Canada. Most orders are shipped via Fedex. We're pleased to announce that we offer flat rate shipping internationally to over 20 destinations for $19.95. Your order will be dispatched from our warehouse within one to two business days. Your order should arrive within three to ten business days. How can I contact Advanced Dermatology? You can reach us by phone on 1-888-983-2703. We’re available 9am-5pm EST. Yes, we offer a 30 day money back guarantee. If for any reason you are not happy with your purchase, you may return the unused portion to us for a refund.